Does an Actroid really need mosquito repellent? Every summer, Kincho (an Osaka-based bug repellent-maker) comes up with a new crop of ads as customers once again look for ways to keep mosquitoes at bay. This summer, they’re re-using one of their ads from a few years back (I believe it first aired in 2011), featuring an Actroid robot demonstrating one of their anti-mosquito skin lotions. While it’s eye-catching, I’m not sure how much need an android has for insect repellent, or whether they need to be worried about skin lotions. While waving her arms around semi-naturally, she says “Insect repellent PreShower is gentle on your skin” twice before asking “Is that all I say?” and then going right back to her prepared line before her companion can respond. The drink is a canned chu-hai called -196C Strong Zero Dry. Chu-hai is a blend of shochu (a Japanese spirit made from grains or sweet potatoes, fairly similar to vodka), blended with fruit juice or other mixers. The concept behind Suntory’s -196C, which has been on the market for several years now, is that the fruit are flash-frozen in liquid nitrogen, then pulverized and blended into the drink mix. It tastes pretty good, but honestly isn’t any different from any of the other brands of chu-hai available. Later variations included -196 Strong, which had a higher alcohol content (8%, compared to the normal version’s 5%), and -196C Strong Zero, which had the same alcohol content but less sugar. The newest version, Strong Zero Dry, doesn’t have any fruit flavoring, and so is slightly more bitter than the other variations. I’ve tried it, and it’s not too bad. I’d certainly drink more if I knew I’d be served by models in flying power armor suits. Sagami Condoms claim to fame is that theirs are the world’s thinnest. To help illustrate that claim, creative director and copywriter Naoki Ito of GT Tokyo agency produced this ad video, titled “Love Distance”. A man and a woman separated by over a thousand kilometers spontaneously decide to bridge the gap between them on foot, as a caption counts down the distance remaining between them in millimeters. Submitted to the Cannes Lions Festival for advertising in 2009, it took the Gold award in the Film category. 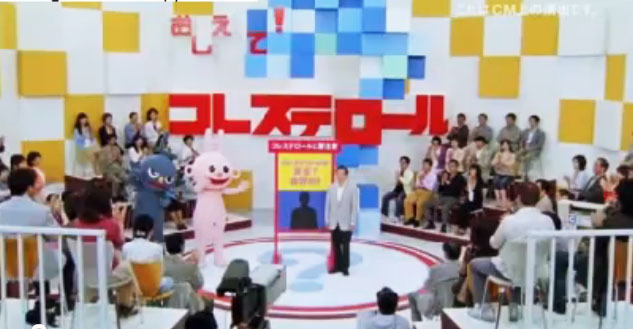 Most TV commercials in Japan aim for either happy and upbeat, dramatic and sophisticated, or sad and poignant (usually charities and PSAs). One recent series of ads, however, advising people to get their cholesterol levels checked for possible arteriosclerosis, has chosen a surprisingly different approach. … then, just as the host mentions that “there are no outward symptoms [of arteriosclerosis], so even if you feel all right…” randomly have someone on the set keel over from a heart attack. 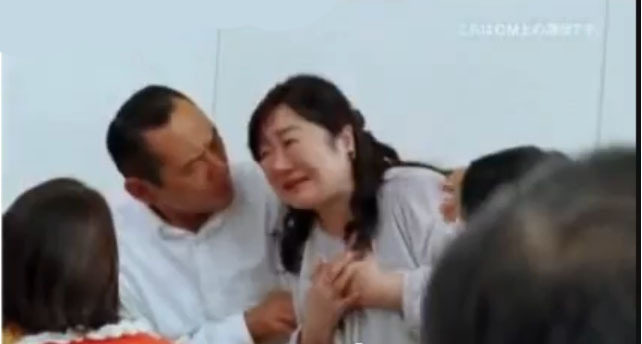 There are a set of five ads, produced by pharmaceutical companies Shionogi and Astra-Zeneca, each one ending with a different heart attack victim. Ending on a shot from the victim’s viewpoint as their vision blurs out and fades to black is an exceptionally morbid touch. It’s very rare to see ads (or even regular programming) here take such a dark turn, so I commend the producers for their willingness to go with something so different. The first one of these I saw was the last one in the video above, in which the viewer at home is the one dying. The surprise ending shocked the hell out of me and actually left me feeling rather shaken for some time afterward. It definitely got me thinking about my cholesterol levels, so I guess it did its job. 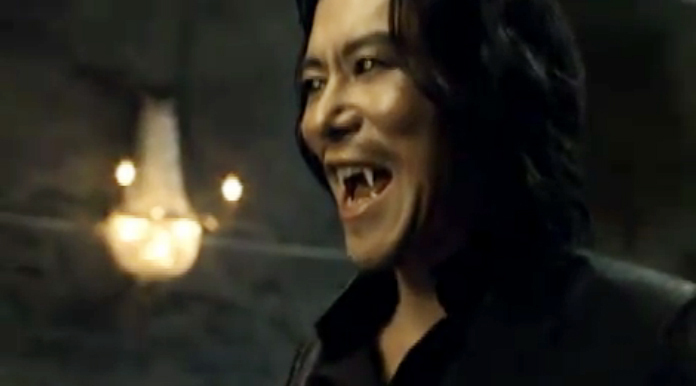 Coca-Cola continues their “Wild Health” campaign with a new add for Coca-Cola Zero Caffeine Free starring Etsushi Toyokawa as a vampire looking for sustenance. While I roll my eyes at the idea of calling anything “healthy” simply because it doesn’t have sugar, and I wonder at the implications of Toyokawa losing his fangs after drinking the beverage (symbolic loss of manhood after choosing caffeine-free diet soda, or simple tooth decay? ), I have to admit it’s still a cool-looking ad. This is not Toyokawa’s first work with Coke. Here’s an ad he did sometime during the past century. There’s no date, but judging by a few things, I’d guess it comes from around 1995. Nissin Foods has just released a new ad for Cup Noodle as part of their 40th anniversary campaign this year. This one features a giant Gundam robot rising to its feet holding an enormous kettle of boiling water, then ends with a somewhat unexpected tagline. 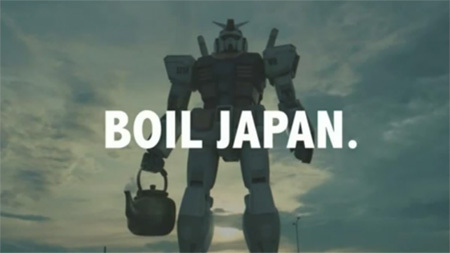 “Boil Japan.” This raised an eyebrow the first time I saw it. After all, between radiation fears in Tokyo and further north, and having to suffer through one of the hottest summers ever with minimal air conditioning (part of the electric belt-tightening made necessary by Fukushima accident), people around here are probably feeling pretty well boiled already. Ok, but why “Boil Japan”? It’s actually a play on words. It doesn’t appear anywhere in the ad, but the answer can be found in the description on their website, where they use the word “Wakasu”, written as 沸かす(to boil), but which can also be written as 湧かす(to boost or raise up). I have to wonder how many in the target audience will get the pun, since it requires them to understand the word “boil” (not a big hurdle), then recognize that one of the many ways to translate it into Japanese is a homophone for “boost or raise up”. Had the voice-over actually said something like “Nihon wo wakasou!” it would have been a lot clearer. The Gundam model used in the commercial is most likely all CG, but it’s very similar to an actual full-scale Gundam statue in Japan. 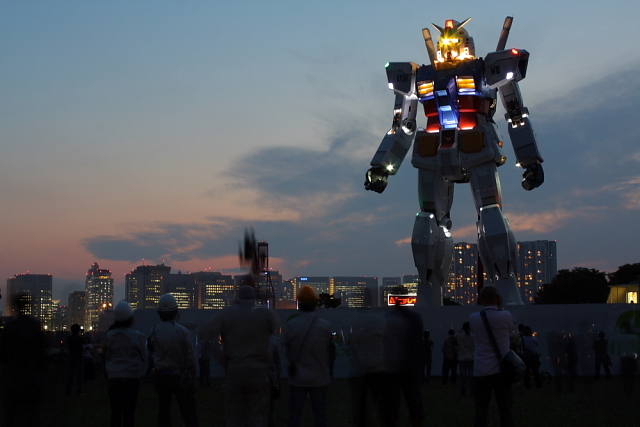 Built in 2009 to commemorate the manga/anime’s 30th anniversary, the 18-meter statue originally stood at Odaiba, where it overlooked Tokyo harbor. At the end of 2009, it was dismantled and moved to Shizuoka, where it now stands near Higashi Shizuoka station with Mt. Fuji in the background. 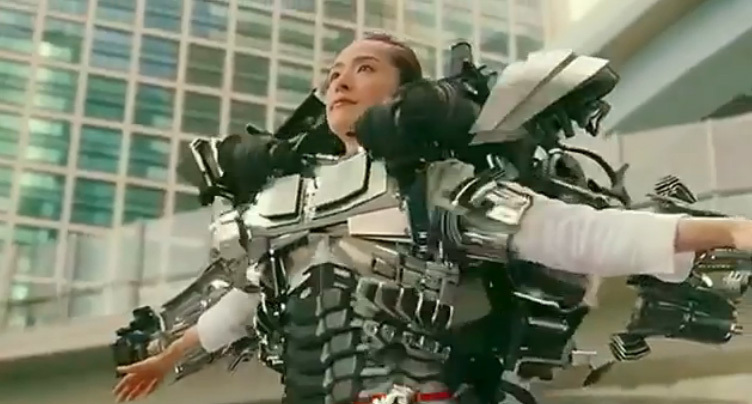 This version of the giant robot doesn’t have nearly the same range of motion as the one in the commercial: far from being able to crouch down and stand up again, the one here can only move its head back and forth. Nissin Foods has recently released a series of commercials for the low-calorie versions of their popular Cup Noodle instant ramen. This latest version, for the Curry flavored noodles, features model/actress Yoko Maki as a veggie-slicing samurai. This commercial shares some similarities with another samurai-themed ad also run by Nissin this year (the 40th anniversary of Cup Noodle), in which artist Takehiko Inoue (perhaps best known for writing and drawing the popular basketball manga Slam Dunk and samurai-era manga Vagabond) paints a larger-than-life (3 meters tall, to be exact) portrait of an Edo-era samurai. According to Nissin, the ad, which was released after the March 11 earthquake and tsunami, was intended to convey a message that “this country has hidden strength” and “to inspire the hope and courage to move forward”.